Western blot analysis of whole cell lysates probed with beta 2 microglobulin antibody (VMA00003) followed by detection with HRP conjugated Goat anti Mouse IgG (1/10,000, STAR207P) and visualized on the ChemiDoc MP with 166 second exposure, Arrow points to beta 2 microglobulin (molecular weight 12 kDa). Beta 2 microglobulin antibody recognizes beta 2 microglobulin. The antibody has been extensively validated for western blotting using whole cell lysates. 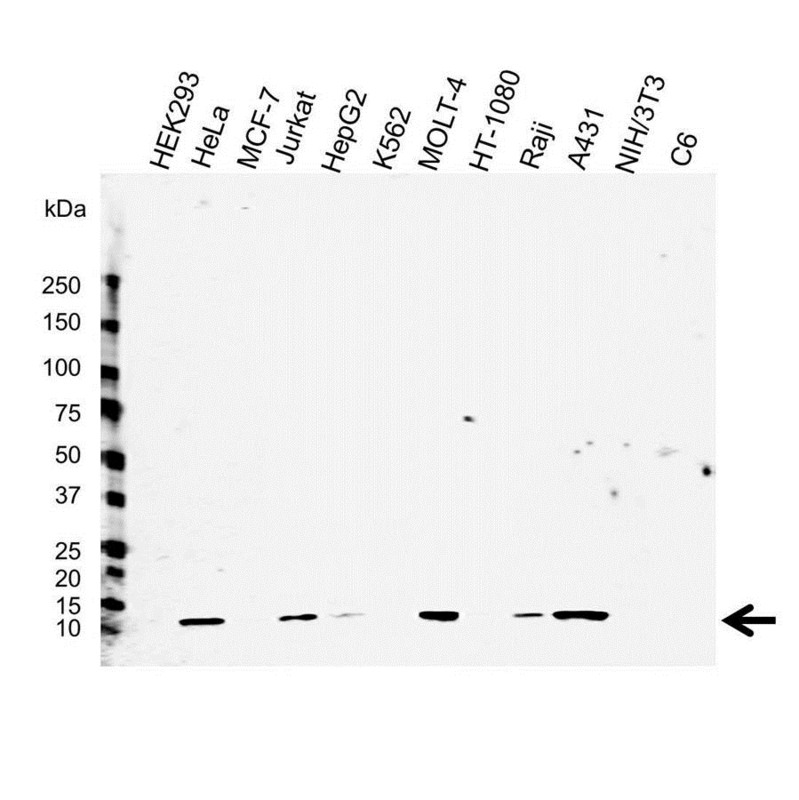 Mouse anti Human beta 2 microglobulin antibody recognizes native human beta 2 microglobulin, a 119 amino acid component of MHC class I molecules present on all nucleated cells, containing a single Ig-like C1 type domain. Levels of beta 2 microglobulin can be used to assess renal function in kidney transplant recipients (Woo et al. 2014). Also known as B2M, it has been suggested that this protein can be used as a prognostic marker for HIV infection (Halota et al. 2002). Mouse anti Human beta 2 microglobulin antibody recognizes β2 microglobulin as a band of ~12 kDa in HeLa cell lysates. Anti beta 2 microglobulin antibody detects a band of approximately 12 kDa in HeLa cell lysates.